Tape Dispensers | J.V. Converting Company, Inc.
JVCC CSD Carton Sealing Tape Dispenser is a hand held durable tape dispenser for carton sealing tapes. Features include side loaded, adjustable break, anti-reverse bar, rubber roller, blade safety guard and a wipe down plate. 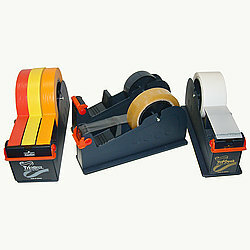 Two sizes are available – one for tapes up to 2 inches wide and one for tapes up to 3 inches wide. The maximum outside diameter of the rolls it can hold is 5 inches. 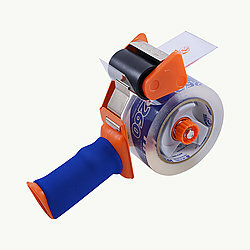 Duck Brand BladeSafe® Tape Gun is a hand-held carton sealing tape dispenser which features a unique retractable blade that protects user from cuts (the blade pops out when pressure is applied to the clear tape pressing wiper). It has antimicrobial product protection on the treated comfort foam handle. Also meets OSHA requirements and has an adjustable tension control knob for smooth tape application. The dispenser ships with one roll of HP 260 high performance 3.1 mil thick packaging tape. The dispenser holds standard packaging tape rolls that come on a 3-inch diameter core. The maximum outside diameter of the rolls it can hold is 5 inches. JVCC EX-17 Steel Desk Top Tape Dispenser is a high-quality steel desk top dispenser used for tape on a 3 inch diameter core. The maximum outside roll diameter the dispensers can hold is 5 inches so it works great for office supply tapes such as Permacel J-LAR and JVCC CELLO-1. It also works with film carton sealing packaging tapes such as Shurtape HP-500 and JVCC OPP-20C and paper console tapes such as JVCC ART-11. Please note that the diameter of full length cloth tapes such as gaffers and spike will be too large to fit into the dispenser. The JVCC EX-17 dispensers come with a weighted-rubber lined base so you can remove the liner to allow it to adhere to a work surface or leave the liner on if you do not want to mount it. The dispenser’s serrated blade is used to cut the tape and there is a safety guard on the dispenser which can be manually pushed up to cover the blade. The dispenser’s blade works well on cutting tape that is 3 mils thick and under. Different dispenser sizes are available for 1″, 2″ and 3″ wide tapes (the 3″ dispenser has three 1″ rollers so you can use it for one 3″ roll of tape or for individual 1″ wide rolls; the 2″ dispenser comes with two 1″ rollers). The approximate dimensions of the 3″ dispenser are 3-7/8 inches wide x 9 inches long x 4 inches high. 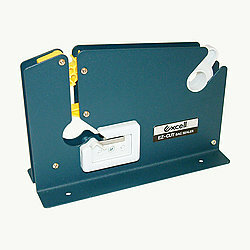 Powerseal / Excell 7605K Bag Sealing Tape Dispenser is a tape dispenser/bag sealer with trimmer for tape up to 12mm wide (approximately 1/2 inch wide) on a 3-inch diameter core. The dispenser can be used to seal produce bags, bakery products, candy items, floral arrangements, industrial parts, newspapers and hardware. The opening at the top of the dispenser (where the bag is inserted) is approximately 5/16 inch wide. 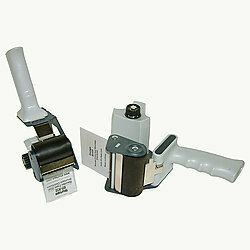 For rolls which are used in this dispenser please see the JVCC BST-22 and BST-24 Bag Sealing Tape products.